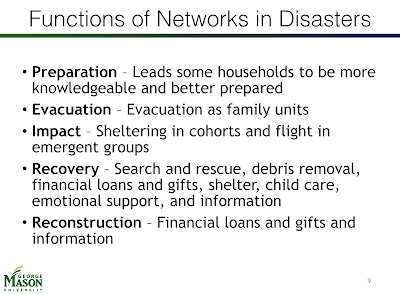 Research in Progress...A Presentation of "From Networks to Recovery"
The last number of months I have been working hard on a paper of my findings on theories of human behavior in disaster and developing the framework for a model of social networks in disaster. This period of focused work has allowed me to make incremental progress on my research, but left little time and few products to post on this blog. Last week was an exception, and I was able to take a break, attend a conference and present my work with fellow anthropologists. Today I'm sharing a presentation of my latest work on dropbox, presentation_link. Conferences provide a welcome break to the isolation of dissertation work and a forum in which to challenge ideas. 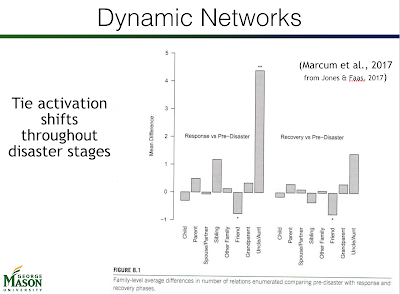 They are a tremendous opportunity to meet others in your discipline and fellow researchers working on similar topics. I was honored to have my abstract accepted and present the current results of my dissertation work at the Society for Applied Anthropology, https://www.sfaa.net/. 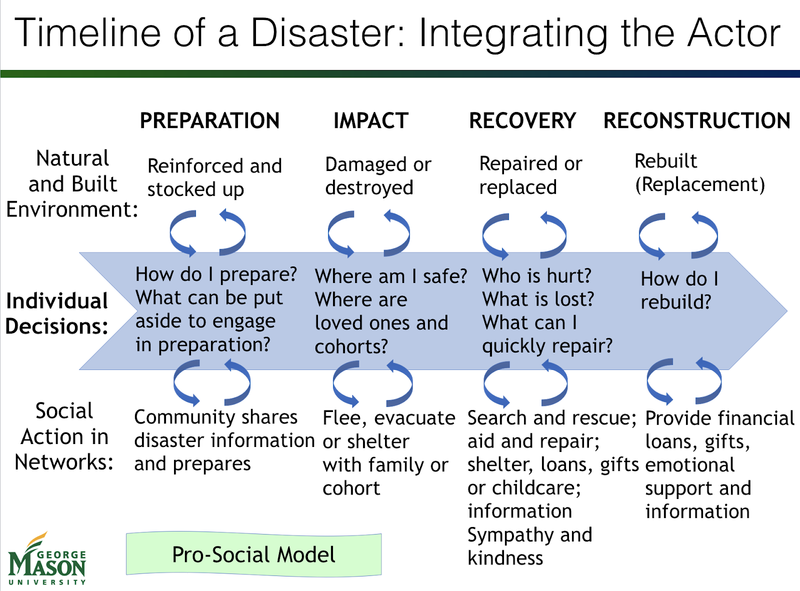 They held their annual meeting in Philadelphia around the theme of sustainability and issues of migration and displacement, climate change, risk and disaster, and access to education, SfAA 2018 Annual Meeting Program. The SfAA is a very active community applying anthropology in the field, and it was a privilege to hear from and talk to people working on similar research problems. 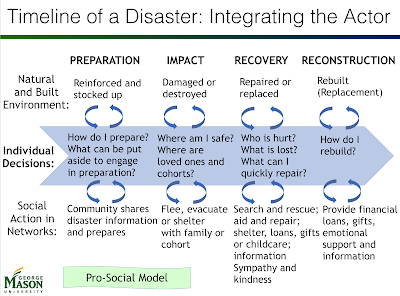 In particular, there was a large body of ethnographic research on people's experiences during and recovering from hurricanes, including preliminary work on the 2017 Hurricanes Harvey and Irma in Texas and Puerto Rico. 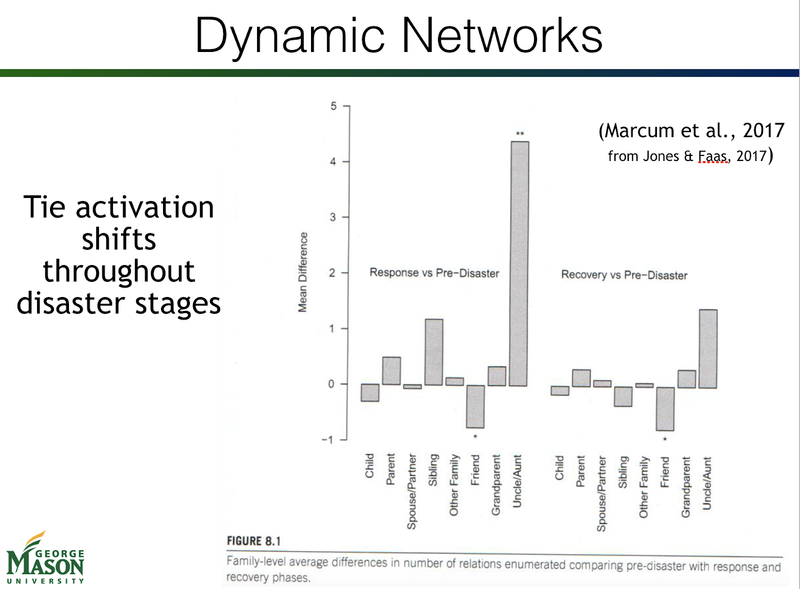 My presentation of an agent-based model of social network dynamics in hurricanes provided an interesting contrasting research method. Taken together the results of ethnographic and modeling methods illustrate how qualitative and quantitative methods can complement each other and improve understanding of human behavior in these events. 1. 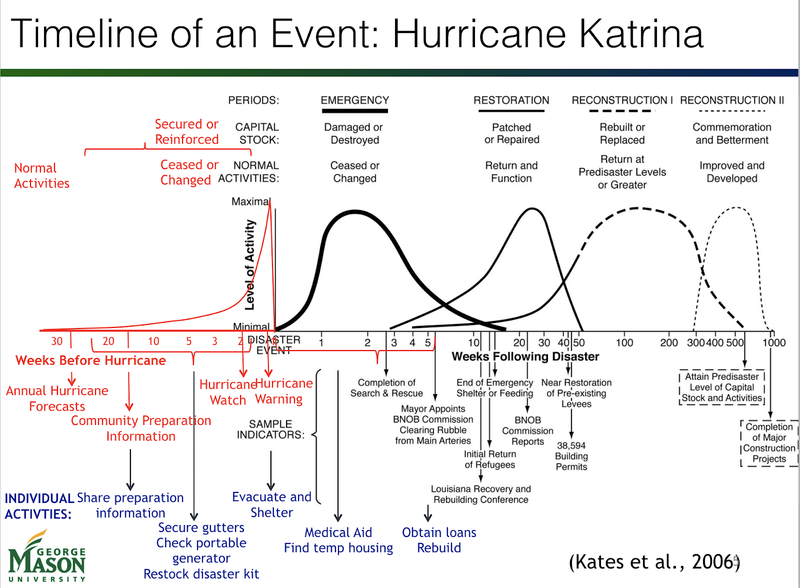 A conceptual timeline of events through the hurricane cycle. 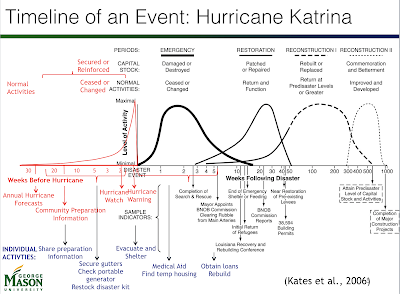 At this point in my dissertation I have the empirical data and framework for a simulated social experiment on social networks through a hurricane cycle. My primary focus will be on coding the model using Java and MASON. Up to now the challenge has been to collect and format empirical data for import into the model, but in the next few months I will be working to encode realistic human behavior and export network data formatted for social network analysis (SNA). 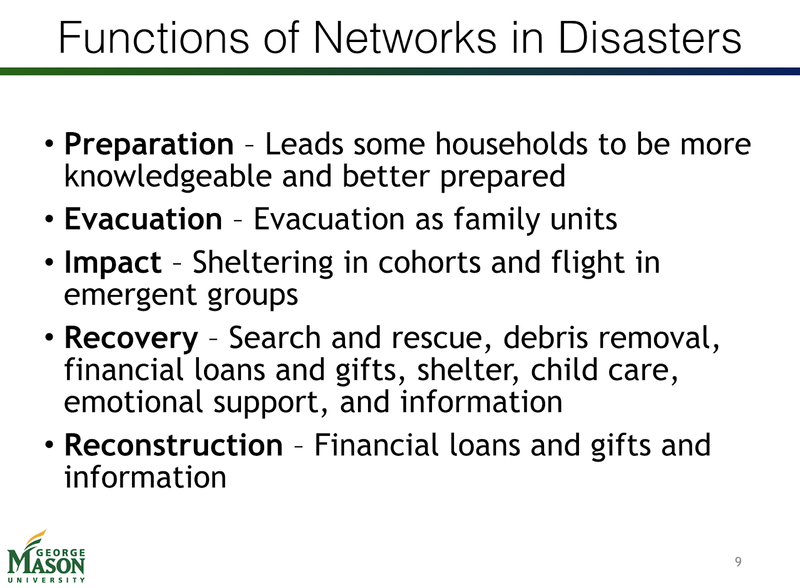 The full presentation "From Networks to Recovery" covers the foundational work for my dissertation and is also available here. Comments and feedback are most welcome. Annetta Burger. Simple theme. Powered by Blogger.